The mainpage creates an eerie atmosphere as soons as you get there. The silhouette of a lictor standing on a rock back lit by a moon is awe inspiring. All it lacks is a low eerie music. The site is superb, loads fast and navigates extremely easily. The menu bar at the top is supported by a breakdown menu bar which allows direct access to a large number of images without going through the gallery. The gallery section is filled with iamges of beautifully created models while the spawning vat contains some very interesting modelling techniques and works in progress. Background section contains information about some campaigns and the species while the aptly named prey species section is actuallu an excuse for the author to display his other armies. The ubiquitous links section complets the site. Brilliant effort at capturing the shadow in the warp. 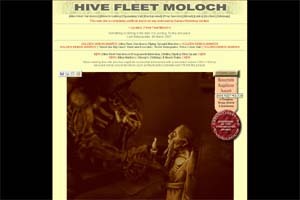 A must visit site for all alien monster breeders. 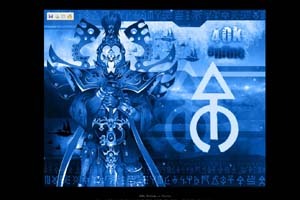 This is the largest and most comprehensive web site suppporting the enigmatic Eldar race. Arrival at the gates greets you with a superb blue colour imagery of the eldar race, creating the atmosphere for the rest of the content. The content is based around a discussion board and the content is found from a side menu bar. Site loads quickly and navigates relatively easily. There are separate sections for news, an unusual 40K hunour section (worth cisiting), gallery and discussion forum. The latter contains a large Eldar, Dark Eldar and Harlequin section, a general section and one for modelling and other races. The gallery contains various albums which are not confined to the Eldar race. From the side menu more options are available for sections supporting other races, each with atctica and other articles. Despite being diluted by other 40K races, this site truly remains the main focus for Eldar players. At the entry you are greeted with a powerful image of an Ork horde breaking through the gates of an imperial outpost. It is seen from the Ork perspective and gives the feeling of an unstoppable horde. Then you are inside, to be greeted by typical orkish glyphs, dialect an grammar. The site loads quite quickly and navigation is orkishly simplistic. The gubbinz section contains a large reference section denoting all available reerences to Orks in GW publications. This is accompanied by some background history and a bibliography of terminilogy related to the Orks. 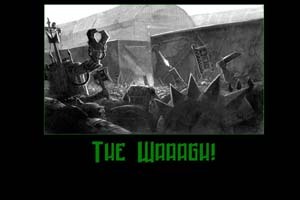 The "Art of Waagh" articles on army building and Ork taktiks while the gallery contains a large number of display armies as well as modelling tips. The usual links section is followed by an acknowledgement page listing those who had undertaken the task of building this site. It also hosts its own chat forum and a separate kompetishun section for competitions held with support from the warstore. This site gives you a modern and sleek appearance, perhaps trying to emulate the greater good of the Tau'va race. Loading as fast as the barracudas and supported by a side bar menu interface as slick as the newest 40K race it has very clean lines. Supporting sections include one on the Tau background, followed by another on starting a new army, essential for newcomers. A few battle reporst and domminated by a large number of tactica articles and home made rules. The site abounds with painting articles, tips, conversion ideas and articles. There are also small sections for battle reports and home made rules for toher races, convertion articles for scenaries, home made fiction and a section on the history and evolution of the site. A great site to visit for all, but particularly more so for those starting a Tau army. 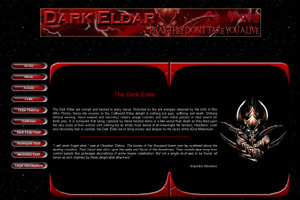 The feel of obsidian fear passes through your spine as you neter this dark red and black web page. Capturing the dread of the Dark Eldar the site maintains that feel throughout its pages. Working off a side menu bar or buttons, the content loads fast in keeping with the nature of their representative race. There are sections on eldar history, background and galleries separately addressing both the dark Eldar and the Harlequins. The gallery is not toolarge and displays single models rather than armies. Fiction created by members of the site is given a separate section and in keeping with the current trend it is supported by its own discussion board. All in all a promising web site supporting the Dark Eldar and captures the mood of that race accurately.